• As an appetizer, serve with crusty bread. • As a dessert, pair with a cherry preserve (a French Pyrenees classic) or glazed/roasted figs. Almost any wine goes well with this cheese. Some in particular are: Pinoit Noir, Sauvignon Blanc, Riesling, Chardonnay, Burgundy. • WHOLE WHEELS WILL KEEP FOR OVER A MONTH. 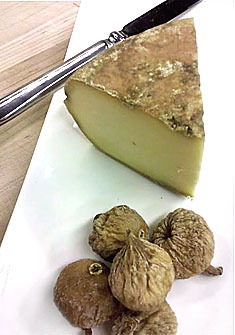 Once the wheel is cut, the cheese should be eaten within two weeks for best flavor. • WRAP WHOLE WHEELS IN FOIL, PLASTIC WRAP, WAX PAPER OR BUTCHER PAPER THEN PLACE IN A ZIP-LOCK BAG. • TO STORE PIECES OF CUT CHEESE: WRAP TIGHTLY IN PLASTIC WRAP OR FOIL AND REFRIGERATE.